Even the most useful new truck-driving technologies can be a pain to integrate smoothly into the driving experience. Sometimes it’s one more thing you have to pay attention to, and sometimes it means adding a technology you just don’t trust. At Peloton, we understand that, and we’re serious about designing our platooning technology in collaboration with the truck drivers who will eventually use it. One way we do that is to have former professional truck drivers on our staff (meet them here). Another way is by conducting field research as part of the user experience (UX) design of our platooning products. During pre-arranged meetings in 2015 at truck stops in Texas and California, we spoke with a total of nine over-the-road and line-haul fleet drivers. Each interview lasted between one and a half and two hours. In this field research, we didn’t talk about platooning specifically, because that technology doesn’t yet exist commercially. Instead, we asked questions about life on the road, and about how technologies then in use were making an impact on the drivers’ work lives. Most of the drivers reported feeling inundated with all the new technologies in their trucks. They already had to use cruise control, collision mitigation system (CMS), lane departure warnings, CB radios, electronic logs, and other technologies as they drove. One problem we heard repeatedly was the lack of integration of these technologies from a user interface (UI) perspective. “It’s like they’re all shouting at me, all the time,” was how one driver put it. Another concern among these professional drivers was that many of the technologies are intended to monitor or make judgments on them and their driving ability. 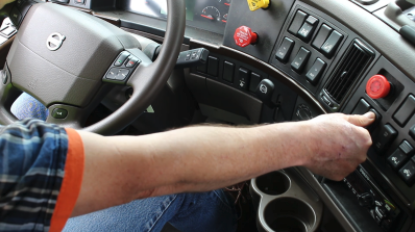 For example, many drivers’ fleet managers had installed cameras (such as DriveCam systems) in their trucks—with one camera pointing out, looking at where the truck is headed, and another camera pointing at the driver, watching what they’re doing. These cameras don’t record video continuously, but in the case of an event such as hard braking or an accident, a buffer captures and saves one or two minutes of the video for managers or investigators to use later. While the drivers understood the intention of the cameras, they didn’t like the feeling of being monitored. They said it felt like a lack of respect for their professional skills as drivers. It’s important that our platooning technology not only be easy to use on its own, but that it also takes into account other in-truck technologies that drivers are managing. It’s hard for drivers to use or respect a technology system if they feel like the system doesn’t respect them. Our platooning technology needs to make drivers feel respected while they’re using it. Another round of field research, in 2016, took us to a truck stop in Sacramento, where we recruited drivers working for fleets whose trucks had automated manual transmission (AMT) and adaptive cruise control (ACC) installed—which are considered precursors to platooning technology. The internet has a number of platooning examples from around the world, including a 2016 European platooning challenge, and we wanted to find out what these drivers with some experience using automated technologies had heard about platooning. Among the drivers who had seen or heard about platooning, we uncovered a number of misconceptions about the technology. For instance, many believed that the follow truck was fully automated and even devoid of a driver; that platooning trucks traveled at a distance of 4 feet apart; or that platooning involved more than two trucks—all of which are incorrect. Drivers also had concerns about the possible impact of platooning on their driving lives, including valid “what’s in it for me?” questions. Many had a visceral reaction to the concept of platooning. Will the system really stop? Am I safe in that seat? Will I lose my job once platooning is implemented? We need to deal with platooning misconceptions directly and make it clear what Peloton platooning does—and doesn’t do. The design of our systems should reinforce the importance of drivers’ skills and situational awareness, in both the lead and the follow truck. Drivers must feel confident that they remain necessary in platooning situations, and we need to help them understand the benefit of platooning for enhancing their skills and their driving experience. 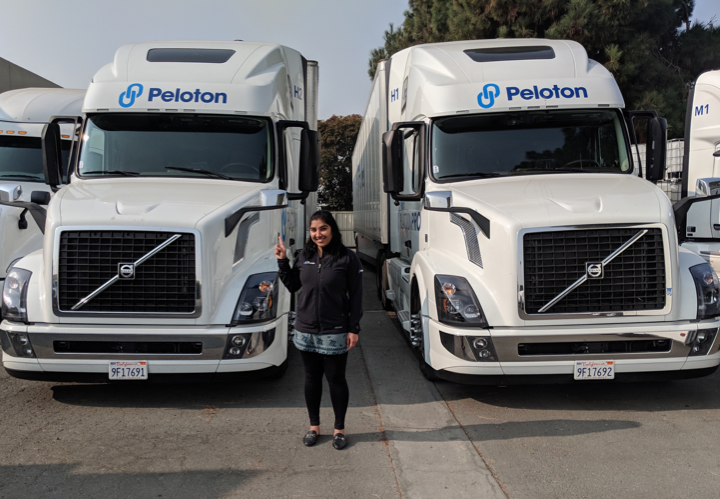 This phase of the research, which took place in 2017 at the same California truck stop as study #2, was designed as a kind of reality check to see if Peloton was effectively addressing drivers’ misconceptions about platooning. The written materials were well received, but the video is what really helped drivers believe for themselves how platooning actually works, in real time. And it wasn’t just the visual aspect; the audio with the noise of braking made a real difference. Drivers had a positive reaction to Peloton’s platooning materials. Next to witnessing platooning in person, videos are the best medium for demonstrating how our technology works. It’s important for drivers to see (and hear) platooning in action. If we address platooning misconceptions directly and honestly, describing what Peloton’s system actually does—as opposed to what some drivers believe or fear it might do—we can overcome drivers’ reticence about platooning. How do the results of this field research show up in the UX design of our Peloton platooning products? In some cases, it’s a matter of validating things we’d already come up with. But in other cases, the insights from talking with professional truck drivers ‘in the wild’ led to some subtle changes in how our system operates. I’ll be back at a later time to talk about that part of the process. In the meantime, I hope you’ll check out more information for drivers about Peloton platooning on our website.